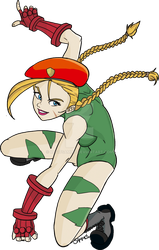 A group dedicated to Cammy and those who love her. Cammy is ©CAPCOM. This is a group for people who love Cammy White. Since this group is dedicated to Cammy, we don't accept art without her in it. Art of her with other characters is fine, however (and we have a folder for that, too). We are fairly liberal with the art that we accept on the gallery, but the Founder has the final word on what stays there. However, be warned that any depictions of torture or abuse are not allowed on the club. This club also does not allow discrimination on the basis of race, gender or sexual idenitity. So I just found out that there's this Korean mobile game callede Destiny's Child, and apparently they recently had a crossover event with Street Fighter, featuring Cammy and Chun Li. Why is that ugly chun in the featured art for CAMMY?! People don't follow the group's rules. I've removed it. Thanks so much for accepting my request!